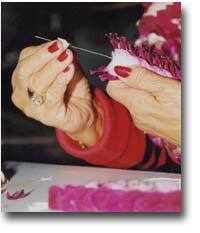 Hawaii lei makers use a special lei needle which is about 10″ long (you can order a lei making kit online), but you can use a large sewing needle. Cut a 45″ piece of dental floss or carpet thread. 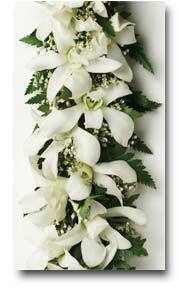 You’ll be making a finished lei that is 36″ long and this will give you enough leftover to tie the ends together. Carefully string the flowers together by going through the centers of the flowers, from front to back, and slide them two or three at a time down the string. When you’ve finished, store your lei in the refrigerator in a moistened plastic bag till you’re ready to use it. The haku style of lei is popular for wearing as a head lei. Small ferns, leaves and flowers of every kind are beautifully woven together to make an impressive, colorful head piece to wear around a hat or on your bare head. In Hawaii, we start with a base about 1″ wide by 28″ made from the plyable base of a banana leaf. You can use thick soft cotton string or a piece of fabric. You’ll need a length of sturdy twine to wrap the leaves and flowers onto the base. Gather together a bit of fern, leaves and a couple of flowers. Place this on the base and wrap the twine around it twice. Repeat this procedure layering the groupings along the base until the lei fits comfortably around your head. Tie and you’re done! Lei photos courtesy of Hawaii Flower Lei .